We wish to introduce ourselves as a company named as Indus Herbs. Indus herbs is the leading suppliers of all Medicinal Herbs, Extracts, Herbal Powders, Spices and Raw materials, essential oils, Ornamental Plants and Planting materials. We are offering Gugal (Commiphora Mukul), interested can contact Indus Herbs. 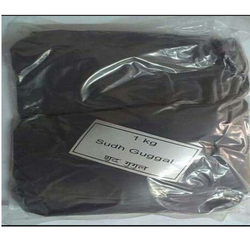 We are offering a wide range of Guggul Extract 2.5%. Throughout history, traditional cultures have used herbs to support a healthy cardiovascular system. One of the most valued Ayurvedic heart botanicals is guggul. The resinous gum exudates of Commiphora mukul present in the bark is very well known for its medicinal properties. Gokshuradi Guggulu is a traditional Ayurvedic compound used to support the proper function of the genitourinary tract. It strengthens and tones the kidneys, Gall bladder and urethra as well as the reproductive system. We are the most trusted name in between the dominant companies in this domain, introducing Guggul Extract to our esteemed clients. Our offered product is free from all hazardous chemical and impurities. Furthermore, Guggul Extract highly demanded in medical industries and is extensively used for herbal treatment.